PS4 Firmware v1.75 is now available to download for, adding 3D Blu-ray support to the console among a few other changes. The new update was released over night, weighing in at 194 MB. In addition to 3D support, the firmware also moves all notifications on the top-right of the screen (like DualShock 4 notifications, System Messages) to the top-left, in line with all the other notifications. Sony has released a new firmware update for the PS4 overnight, updating the system software to v1.72. The minor update weighs in at 194 MB and is mandatory if you want to continue to access the PlayStation Network. The update does nothing more than improve system stability. PS4 Firmware v1.70 was released earlier today, featuring a number of changes and improvements to the System Software. However, Sony has also made a number of undocumented changes to the system, which we’ve discovered while playing with the latest update. With the release of Firmware v1.70 for the PS4, Sony enabled the exporting of saved videos and screenshots to external devices. You need to have a FAT32 formatted USB drive in order to copy content across. PS4 Firmware v1.70 releases in just a couple of days, bringing many features and improvements to the system, including recording of HD game footage to external devices, the SHAREfactory video editing application and more. PlayStation Japan has released a video to show more of the new features in action, but in Japanese of course. 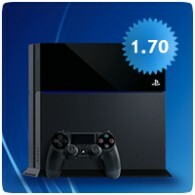 The Official PlayStation Page for Greece on Facebook has accidentally revealed that the next major firmware for the PS4, version v1.70, will be releasing next Wednesday, 30th April 2014. The Facebook post has since been deleted, but not before we were able to snap a screenshot of it.